Marie Sklodowska-Curie, also known as Marie Curie, Polish and naturalized-French physicist and chemist Nobel Prize in Physics in 1903 and in Chemistry in 1911. Marie Curie is best known for discovering radium, yet she achieved many more accomplishments. Here is a brief biography of her claim to fame. 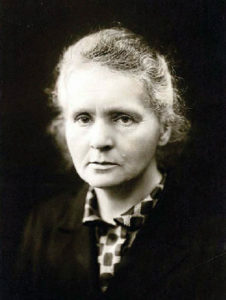 Marie Curie pioneered radioactivity research, She was the first two-time Nobel laureate and the only person to win the award in two different sciences (Linus Pauling won Chemistry and Peace). She was the first woman to win a Nobel Prize. Marie Curie was the first female professor at the Sorbonne. Maria Sklodowska was the daughter of Polish schoolteachers. She took work as a teacher after her father lost his savings through a bad investment. She also participated in the nationalist “free university,” in which she read in Polish to women workers. She worked as a governess in Poland to support her older sister in Paris and eventually joined them there. She met and married Pierre Curie while she was studying science at the Sorbonne. They studied radioactive materials, particularly the ore pitchblende. On December 26, 1898, the Curies announced the existence of an unknown radioactive substance found in pitchblende that was more radioactive than uranium. Over the course of several years, Marie and Pierre processed tons of pitchblende, progressively concentrating the radioactive substances and eventually isolating the chloride salts (radium chloride was isolated on April 20, 1902). They discovered two new chemical elements. “Polonium” was named for Curie’s native country, Poland, and “radium” was named for its intense radioactivity. In 1903, Pierre Curie, Marie Curie, and Henri Becquerel were awarded the Nobel Prize in Physics, “in recognition of the extraordinary services they have rendered by their joint researches on the radiation phenomena discovered by Professor Henri Becquerel.” This made Curie the first woman to be awarded a Nobel Prize. In 1911 Marie Curie was awarded the Nobel Prize in Chemistry, “in recognition of her services to the advancement of chemistry by the discovery of the elements radium and polonium, by the isolation of radium and the study of the nature and compounds of this remarkable element”. 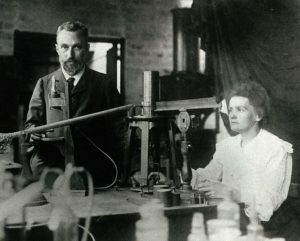 The Curies did not patent the radium isolation process, choosing to let the scientific community freely continue research. Marie Curie died from aplastic anemia, almost certainly from unshielded exposure to hard radiation.